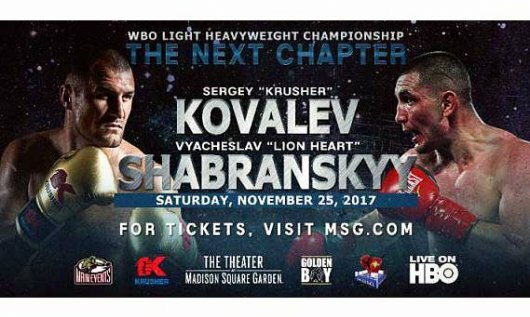 The International Boxing Association recently announced that it will sanction the upcoming light heavyweight world title fight between former unified world champion Sergey "Krusher" Kovalev (30-2-1, 26 KO's) and Vyacheslav "Lion Heart-Chingonskyy" Shabranksyy (19-1, 16 KO's) on Nov. 25 at The Theater at Madison Square Garden. This means the IBA light heavyweight title will be on the line in addition to the vacant WBO world title. Two former world champions square off in the opening bout of the HBO tripleheader (10 pm. ET/PT) as Jason Sosa (20-2-4, 15 KO’s) fights Yuriorkis Gamboa (26-2, 17 KO’s). The 10-round non-televised undercard bout between Bakhram Murtazaliev (10-0, 8 KO's) and Carlos Galvan (16-5-1, 15 KO's) will be for the IBA super welterweight world title.